The Seniors Center takes their grassroots fight to protect retirees’ benefits to the White House. 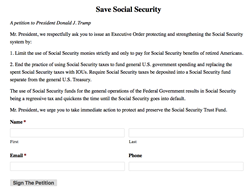 The Seniors Center's Save Social Security Petition asks President Trump to protect Social Security benefits. Washington, D.C. based nonprofit The Seniors Center is petitioning President Donald J. Trump to strengthen and protect the Social Security benefits of American seniors by signing an Executive Order separating FICA payroll tax income from the U.S. Treasury’s general funds and directing that these monies only be used to fund Social Security. “Social Security tax money should pay for Social Security, and not be spent on other things. Current Social Security taxes do not cover the cost of benefits, and it’s crucial that the Treasury repay,” said Dan Perrin, president of The Seniors Center. “The practice that Social Security taxes are spent on general U.S. Government expenditures and those monies are replaced with an IOU held by Social Security should end. Most Americans would rather Social Security hold real dollars, not IOUs. Our petition urges the end of this practice,” said Perrin. For a more detailed policy discussion, please see The Seniors Center’s memo here. With the Congressional Budget Office projecting Trust Fund insolvency as soon as 2034, Mr. Perrin believes Americans are at a crossroads. Budget gimmicks must not be relied on when the solvency of the Social Security Trust Fund is officially projected to be in less than twenty-years. The Seniors Center invites concerned Americans to join their effort to strengthen and protect Social Security by visiting their website and signing the Save Social Security Petition.